In celebration of Saturday Night Live’s 40th anniversary, the long-running sketch show has been feted with all sorts of honorific tie-ins, ranging from the conventional (a 433-hour marathon on VH1) to the stiffly ceremonial (a museum exhibit) to the completely ridiculous (Saks Fifth Avenue’s “SNL-inspired” clothing line). Somewhere in the middle is It’Sugar’s new line of SNL novelty candy, which recalls Ben & Jerry’s in its attempt to translate the show’s characters into foodstuffs that kind-of, sort-of recall them. 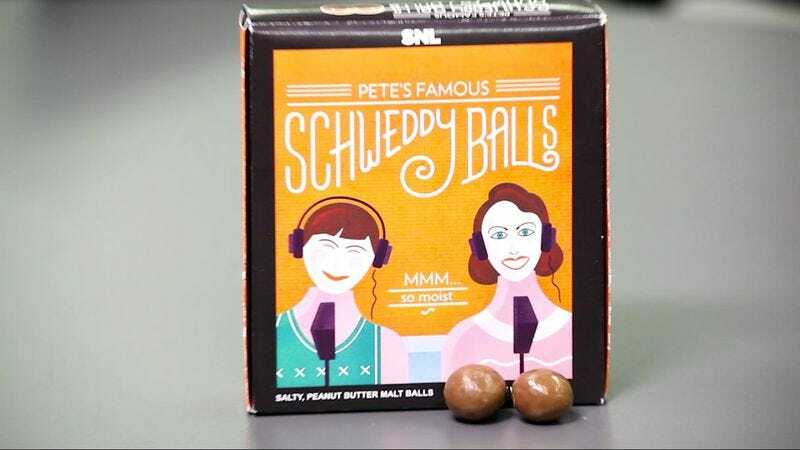 While the actual collection ostensibly spans all decades of SNL—save for a suspicious, 1980s-shaped hole—the sampler box we received was weighted heavily toward more recent breakouts like Stefon, Drunk Uncle, and the Vogelchecks, allowing for plenty of familiar grousing that the cast of SNL candy was way better back when we were in high school. (As you’ll see, it was also weighted heavily toward jokes about dicks and balls.) Anyway, with a few rare exceptions that made us optimistic for the next bit, none of it was particularly great candy. And most of the time, once the initial novelty wore off, it wasn’t much fun to keep eating it. So in that sense, It’Sugar did an excellent job capturing the experience of watching SNL.